"Chronic exposure to wireless radiofrequency radiation is a preventable environmental hazard that is sufficiently well documented to warrant immediate preventative public health action." "The current medical literature raises credible questions about genetic and cellular effects, hormonal effects, male fertility, blood/brain barrier damage and increased risk of certain types of cancers from RF or ELF levels similar to those emitted from “smart meters”. Children are placed at particular risk for altered brain development, and impaired learning and behavior. Further, EMF/RF adds synergistic effects to the damage observed from a range of toxic chemicals. Given the widespread, chronic, and essentially inescapable ELF/RF exposure of everyone living near a “smart meter”, the Board of the American Academy of Environmental Medicine finds it unacceptable from a public health standpoint to implement this technology until these serious medical concerns are resolved. We consider a moratorium on installation of wireless “smart meters” to be an issue of the highest importance." The transmitting meters most often being used transmit continuously, every few seconds. This is picked up by a receiver and logged by the utility. You are exposed to the transmissions from all the meters within transmitting range. The meters often have a range of over 2 miles. Thus, the exposure is continuous and the "safety" standards the meters comply with are irrelevant to the situation. Please read this letter from the Radiation Protection Division of the Environmental Protection Agency (EPA) regarding the limitations of the FCC standards. The transmitting meters can also put high frequencies directly on home and building wiring. This can happen deliberately through signaling to electrical loads or inadvertently through poor engineering. Poorly engineered meters can cause electrical pollution by putting the transmitted signal directly on home wiring or by the way they draw power to operate. Signals in the range of 30 to 60 kHz have been measured and result from poor engineering in the way the meters obtain power from the electrical grid in order to operate. Taking the steps on the Solutions page can help alleviate symptoms being caused by the meters. Meters could be properly engineered so that they would not be highly electrically polluting. Whether deliberate or inadvertent, studies are finding high frequencies on building wiring is related to a host of health problems. Milham and Morgan found a dose-response relationship between high frequencies present on building wiring and cancer. Removing high frequencies on building wiring has improved MS symptoms, blood sugar levels, asthma, sleep quality, teacher health, headaches, ADD, and numerous other health problems. (Visit Research page to see papers.) Technical papers provide a solid electrical and biomolecular basis for these effects. A recent paper by Ozen, showed that transients induce much stronger current density levels in the human body than does the powerline 60Hz signal. A technical paper by Vignati and Giuliani discusses the authors' findings that high frequency communication signals on power lines also induce much stronger electrical currents in the human body than a low frequency signal of the same strength. The induced currents disturb normal intercellular communications. This causes harmful short-term and long-term effects. Please see the Technical page for information about properly measuring the high frequencies on building wiring that are causing health problems. There is also a simple meter that lay people can use to easily measure most high frequencies on building wiring. The additional electrical pollution from the transmitting meters is also greatly exacerbating the ground current problem. Please see the Introduction page for more details about ground currents. The objectives of the Smart Grid Program can be accomplished without transmitting meters and without using other technology such as high frequency communication over power lines, which are also harmful to human health. It simply requires that meters be selected that are properly engineered to meet the needs of the program without using dangerous technology. Multi-rate billing and other sophisticated metering options do not require that the meter transmit. Models are available that download periodically on phone lines, dedicated communication lines, or are read by a reader the meter reader carries. Dedicated communication cables can be used to shut off or allow on certain power consuming electronics such as air conditioners. It is essential that only meters that do not transmit or put high frequency signals on building wiring are approved for the Smart Grid Program. At this time, however, it is important to know that many new appliances are being outfitted with transmitters that transmit continuously and cannot be turned off. Be sure to ask detailed questions if you are purchasing new appliances. The un-safeness of the "safety" standards for the continuously transmitting smart meters is apparent from the reports of health problems ranging from headaches to poor sleep to heart palpitations that begin after their installation. Transmitted microwave and radiofrequency radiation also have the potential for causing serious long-term health consequences, even for those who do not notice overt symptoms. The majority of independent studies report similar results: impairment of cellular communication, DNA breakages, increased stress proteins, etc. Read about it in Disconnect Studies targeting cellphone and cordless phone usage are finding increased risk of brain tumors. Children seem to be particularly vulnerable. Exposure to radiofrequency radiation has also been linked to an increased risk for cancer, including lymphoma, leukemia, brain tumor (cellphones), melanoma, parotid gland tumors, and breast cancer RISKS OF CARCINOGENESIS FROM ELECTROMAGNETIC RADIATION OF MOBILE TELEPHONY DEVICES. A review of studies performed prior to 2007 is available at http://www.bioinitiative.org. A recent public health study provides particularly strong evidence that we should be concerned about continuous exposure to transmitted microwave radiation. It can be found in a paper published in Pathophysiology (Volume 16, Issue 1, June 2009, Pages 43-46) Apparent decreases in Swedish public health indicators after 1997-Are they due to improved diagnostics or to environmental factors?. The authors looked at trend lines in data collected by the Swedish government and found that the introduction of cellphone technology nationwide in 1997 coincided with the beginning of an accelerating deterioration of several health indicators. Specifically, the rates of prostate cancer, brain tumors, melanomas and lung cancers in the elderly all increased dramatically. So did deaths from Alzheimer's disease, traffic accident injuries, sick leave rates, and percentage of infants born with heart problems. This paper is short and well worth reading. We should resolve the public health questions before introducing further public exposure to microwave radiation, particularly involuntary continuous exposure. Radiowave and microwave radiation are not just a problem for people, they are causing serious problems for animals of all types and plant life as well. Please visit http://www.hese-project.org/hese-uk/en/issues/emr.php?id=bees and http://www.hese-project.org/hese-uk/en/issues/ for more information. Spread the word about the public health threat posed by transmitting smart meters. Link to http://www.electricalpollution.com/smartmeters.html on your Facebook or MySpace page, if you have one, notify your friends online via email, or write a Letter to the Editor of your local paper - it is likely to be published.Install a permanent sign on/near your meter(s) asking that no transmitting meter be installed. (Temporary signs seem to easily get "lost" or "blow away".) See picture. This one utilizes vinyl lettering. Sage Associates performed computer modeling and did measurements on at least two models of transmitting electrical meters. They have found that under certain circumstances those meters are not even in compliance with the inadequate FCC guidelines. http://sagereports.com/smart-meter-rf/. 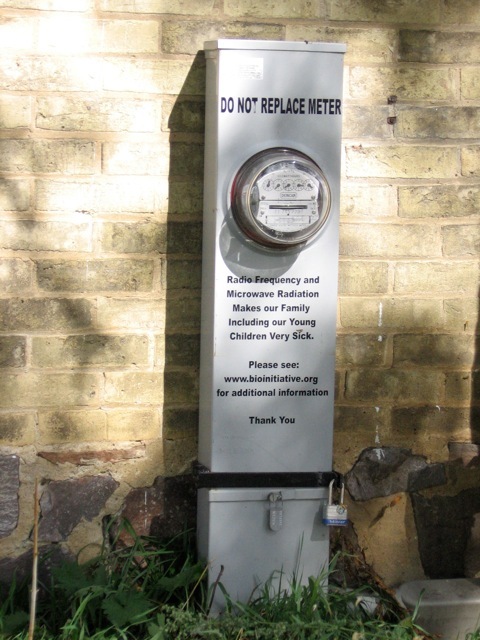 The American Academy of Public Health has called for a moratorium on in the installation of transmitting utility meters. They were very concerned about the threat they pose to public health. http://aaemonline.org/images/CaliforniaPublicUtilitiesCommission.pdf and http://aaemonline.org/pressadvisoryemf.pdf. The Santa Cruz Health Department made a report on transmitting utility meters. They were very concerned about the threat they pose to public health. The health department report is partway through the document. http://sccounty01.co.santa-cruz.ca.us/bds/Govstream/ASP/Display/SCCB_AgendaDisplayWeb.asp?MeetingDate=1/24/2012. Opt-out programs should be easier to obtain because, in spite of the hype, transmitting meters are not helping to save energy. See this press release from the Connecticut Attorney General stating that they have asked that the Department of Public Utility Control terminate the Connecticut smart meter program on those grounds after a pilot study showed that there were no energy savings http://www.ct.gov/ag/lib/ag/press_releases/2011/020811clpmeters.pdf. Ask your attorney general to do the same. Please also pass this on to environmental groups and others pushing this program on the basis of energy savings. Using energy consumptive devices to do the job of a non-energy consumptive device does not save energy. Use this brief, but thorough outline of the full scope of the public health threat posed by exposure to high frequencies from electrical pollution and from transmitters to educate your legislators and other professionals concerned with public health about the threat and the solutions. Click here for more information on how to be most effective. Use the Smart Grid Background document and the Smart Grid Opt-out documents prepared by Sage Associates about the Smart Grid System being used by some utilities in California to educate yourself and others and to take action. These documents are geared specifically for people who are on those utilities in California. However, they may be useful to others as well. Please feel free to pass them on. Modify and use handouts available at http://emfsafetynetwork.org/ to raise awareness about this public health threat. Others have successfully used this information to call for a moratorium on transmitting smart meter installation in their area. See http://www.sfgate.com/cgi-bin/article.cgi?f=/c/a/2010/02/26/BU871C79IM.DTL&type=business for an article on the fight in Sebastopol, CA, USA. Email the small file size poster about the public health threat posed by transmitting utility meters or print and post it in your community. Use the large file for better resolution, if necessary. See the Solutions page for steps you can take to reduce your exposure to radiofrequencies. Often reducing your exposure to all sources makes you more able to tolerate the sources over which you have no control. In the Transmitters section, there are now instructions for shielding the transmitting meters to protect your health while you work toward getting them removed. "A Basic Summary of the Neurological Effects of Radiofrequency Sickness"
No, Your Patient Is NOT Crazy Information for doctors on radiofrequency sickness, diagnosis, mechanisms, and treatment. This is more generalized than the write-up above. Hopefully, this will help you get the support from your doctor as you work to clean up your environment and regain your health. Use the following references to educate your physician about the very immediate and serious effects transmitted radiofrequency radiation can have on your heart. My patient, ****, began suffering symptoms of radiofrequency sickness shortly after installation of the transmitting smart meter on her/his home. Radiofrequency sickness is caused by overexposure to radiofrequency radiation (cite article(s)- see above) and is resulting in her/his case from the exposure being caused by your meters. Please immediately remove the meter and replace it with non-transmitting induction-type watt hour meter/non-transmitting mechanical gas/water meter so as to prevent her/his health from deteriorating further. UL listing generally indicates fire safety, among other things. Smart meters in CA have caused fires according to this article. Food and Drug Administration - The FDA regulates electronic consumer products that emit radiation (such as microwave ovens and video monitors and cellphones and other wireless devices). You can file a complaint through the Medwatch Program on their website at https://www.accessdata.fda.gov/scripts/medwatch/medwatch-online.htm or by calling 1-800-FDA-1088. The same program that regulates medical devices, regulates consumer products that emit radiation. An FDA report can also be filed using the form found at this link: http://www.fda.gov/downloads/AboutFDA/ReportsManualsForms/Forms/UCM236066.pdf If you have been injured by the radiation emissions from Smart Meters (aka AMR or AMI electric, gas, or water utility meters), or any other EMF or wireless device, please complain to the FDA using this form also! Click on the link above, download the form, and mail it to the FDA (address on the form). You can do this if you live in other countries if your meter was made in the USA or by a U.S. company. Let's get the FDA to investigate Smart Meters and other EMF hazards. Consumer Product Safety Commission - The Consumer Product Safety Commission is responsible for taking dangerous products off the market. You can file a complaint with the Consumer Product Safety Commission at 1-800-638-2772 or https://www.cpsc.gov/cgibin/incident.aspx. Consumer Reports - Consumer Reports is an independent nonprofit concerned with product safety. They are one of the most influential non-governmental product safety organizations. It is essential to getting their attention focused on this issue that they receive notice of safety problems caused by the transmitting meters so please go to http://custhelp.consumerreports.org/cgi-bin/consumerreports.cfg/php/enduser/ask.php. This is their email contact form. You will need to select Consumer Reports Magazine, Share an experience, Reporting a safety issue in the successive pulldown menus. If you are disabled, or becoming disabled by the exposure, please see information below about filing disability related complaints. I was told that filing a complaint with the Special Litigation Section does not preclude filing a complaint under the ADA. It is very important that you file a written complaint with your PSC/PUC. Written complaints often get handled differently and often state statutes require that the PSC/PUC open an official inquiry if a certain number of complaints on the same topic are received. Information about the ADA can be found at www.ADA.gov. Amendments at the beginning of 2010 have expanded the scope of the ADA. Disclaimer: I am not a lawyer, so this does not constitute legal advice, just a list avenues and options you may want to explore. You may need to consult a lawyer specializing disability law in order to fully protect your rights. Those of you who have been diagnosed with a disability that is related to your exposure to radiofrequency radiation or are disabled by radiofrequency sickness may have additional options for places to turn to. Local Centers for Independent Living may be able to offer some assistance. In spite of the fact that there was an article in the the NCIL newsletter about radiofrequency sickness and transmitting smart meters ( http://www.ncil.org/resources/radiofrequencyarticle.html), you should count on having to educate your local CIL. The article that ran in the NCIL newsletter may help, as might the information above for physicians. They may be able to help give guidance and support in dealing with the utility companies. Please be sure to include documentation of the denial of reasonable accommodation, doctors letters, and research articles documenting the existence of detrimental biological effects. They will not stop installing these meters unless complaints are filed. Check back or join the email list for further steps you can take. Please see the Solutions page for a list of steps you can take to reduce your exposure to high frequencies in your home and the Take Action page for other ways you can help restore a safe EMF environment to the world.